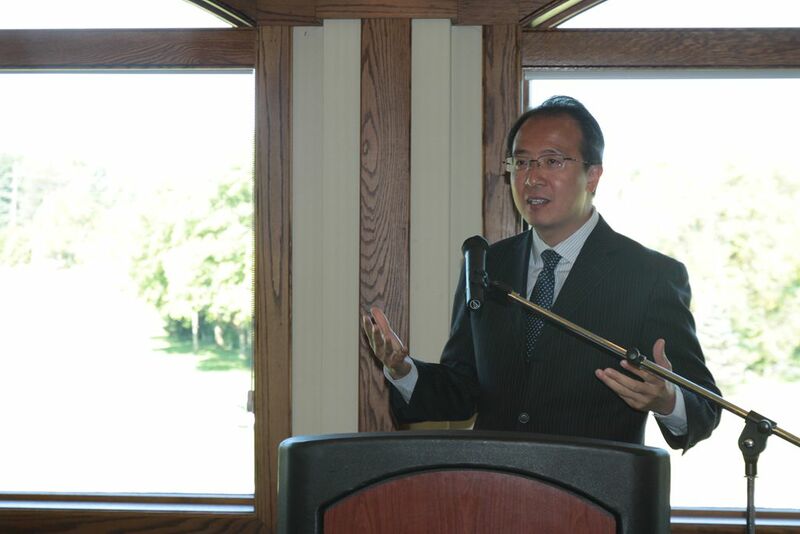 On September 20, Consul General Hong Lei paid a visit to the City of Muscatine, Iowa and delivered an address at a luncheon hosted by Mucatine-China Initiatives Committee. 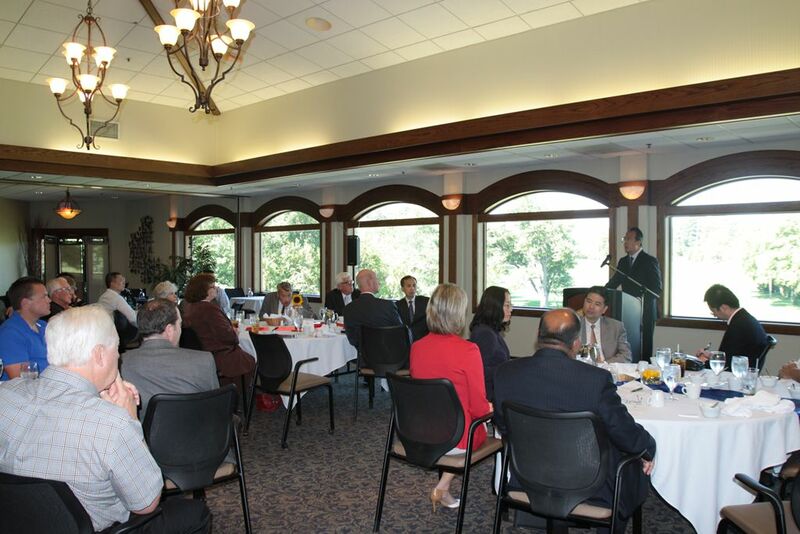 Muscatine Mayor Diana Broderson, Mucatine-China Initiatives Committee Chairman Dan Stein, Director of Muscatine Chamber of Commerce and Industry Greg Jenkins as well as representatives from the local business community were present at the luncheon. Consul General Hong Lei said that although Muscatine is relatively a small city in Iowa, it occupies a special place in the overall picture of China-US friendship. President Xi Jinping visited Muscatine twice as party secretary of Zhengding County, Hebei Province and the Chinese Vice President respectively and had a good time here with the old friends. Today the tree of friendship between Muscatine and the Chinese people is already flourishing. 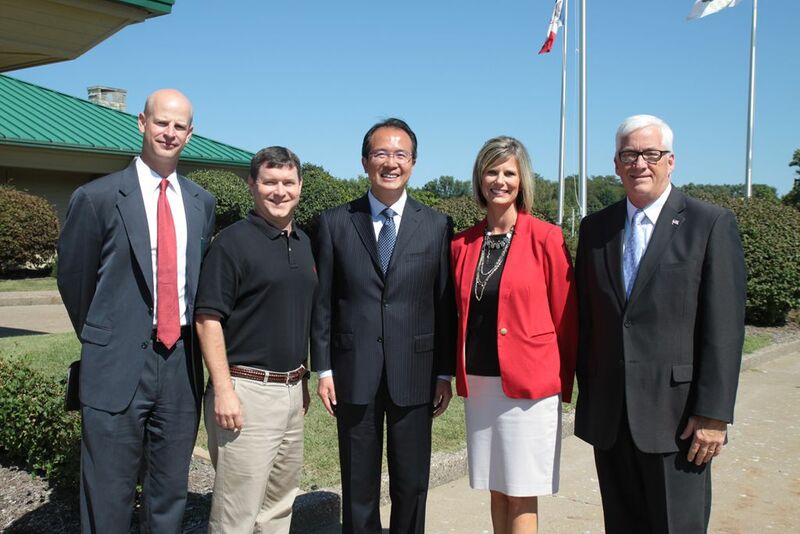 Consul General Hong Lei said that state-to-state relations ultimately rely on the support of the people. Without successful cooperation at the sub-national level, it would be very difficult to manage overall long-term bilateral relations. With the support of local governments and the people of both sides, sub-national exchanges and cooperation between China and the US continue to grow with a dynamic momentum. Thirty-one Chinese provinces/regions/cities have established more than 40 sister province/state relations and 200 sister-city relations with their American counterparts. Consul General Hong Lei said that China is Iowa's third largest trading partner, with a trade volume of 2.7 billion dollars last year, a 14 percent increase year on year. Over the past 15 years, Chinese companies have invested more than 1 billion dollars in Iowa, creating more than 4,000 jobs. The University of Iowa has also established a Confucius Institute. More than 5600 Chinese students are studying in this university, accounting for 45% of the total international students in the state. These exchanges and cooperation have brought the two peoples much closer. Consul General Hong Lei said that China-US relations have, on the whole, maintained steady growth and enjoyed deepening practical cooperation in all areas. In 2015, bilateral trade between China and the US reached nearly 560 billion dollars, a huge increase from 2 billion at the beginning of our diplomatic relations. Two-way FDI stock has accumulated to about 150 billion dollars. By 2015 Chinese investment in US created more than 80,000 jobs. About 5 million visits were made between the people of both sides and over 2.6 million Chinese traveled to the US. Earlier this month, President Xi Jinping met with President Obama in Hangzhou, China. Both heads of state reached a series of important consensus on further building a new model of major-country relationship between China and the US and expanding cooperation at bilateral, regional and international level. Consul General Hong Lei said that the huge economic aggregates of China and the US will create huge opportunities. Reform and development introduced by our two countries will boost our cooperation. Complementary nature of China's provinces and the states in the US will unlock more potentials for more cooperation. Sub-national exchanges and cooperation between the two countries have a bright future. The Consulate General fully supports Iowa to engage with China extensively in areas like economy, trade, education, tourism, and youth and hopes to further promote the friendly exchanges and cooperation between the City of Muscatine and the State of Iowa, so as to add building blocks to the bridge of China-US friendship and write a new chapter of China-US sub-national cooperation. Deputy Consul General Liu Jun was present at the luncheon.